Famed wild beast Donkey Kong is under scrutiny today amidst accusations that he is responsible for a string of intrusive raps that have caused emotional stress to local residents. 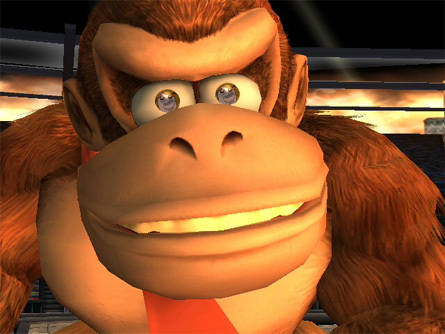 Having first begun his rap career in 1999, "DK," as he is sometimes called, has become infamous in quaint Tree Top Town for his often prolonged, and usually public raps. "We all know DK around here," says local resident Vanessa Dante. "He's usually quite vocal when he's rapping, screaming about how he's big and fast and strong and all that. He's quite a marathon rapper, and everyone's put up with a rap or two from Donkey before. But lately it's just got a little out of hand." A recent rap scare was triggered when locals informed police that Donkey Kong had entered the local park, stating that he was "ready to perform." He then removed his overcoat to reveal two turntables and a microphone. Press reporters contacted an area woman who chose not to be identified about the event. "He told me to put my hands together, if I wanted to clap, as he took me through his monkey rap," she said, sipping a drink. "I did what he said, I don't mind a good rap now and again. But then he released this crazy groan, and started pounding away," she remarked. "He was just beating his fists into his chest, screaming words incomprehensibly. I mean I've put up with some weird raps before but this was definitely the worst." The usually well-behaved DK was also cited this past spring for the unlicensed discharge of a firearm, according to local testimony. "He asked if I wanted to get a good look at his coconut gun, and I said sure, I'd take a look, I don't often see those kind of things," a local witness told reporters. "He told me it fired in spurts, and warned me fairly that if he shot me, it was going to hurt. Now, I'm not one for coconut milk, but I was a little thirsty, so I'll admit I let him shoot it all over my face. It was watery and delicious, a little sweet—the perfect summer refreshment. It actually didn't hurt at all. It felt pretty good." Reportedly, the furry mammal has even tried to recruit citizens to assist him with every-day activities. "Just the other day," a local student said, "I ran into Donkey down at the Swap 'n Stop, and he kind of cornered me in the banana section. I asked if he needed anything, and he asked me if I'd peel his banana for him," she said. "I don't mind peeling bananas, cause I know it can get pretty hard. But you'd think he'd be able to peel his own banana wouldn't you? Anyway, as I was peeling it he just showered me with his rap. Those rhymes were white hot, but I can't say I had really thought I'd go grocery shopping and end up getting a free rap." Despite the complaints, police are confident that DK will be back on his feet in no time. "We're not entirely sure what's gotten into him, but he's offered the citizens of Tree Top some really gentle and good-hearted raps in the past," Chief of Police Ramby told reporters. "We just asked him to withdraw a little bit, you know, keep the raps inside the walls of his own house and spare the town for a while. If he could bust a few rhymes on his own first I think he'd get the urge to do it in public out of his system." But not all the locals are convinced this warning will be enough. One resident complained that DK apparently has been soliciting help for his new album all over town. "He asked me if I wanted to go back to his place and help him make Donkey Kong Jr.," said Becky Tilfert, a student at the Tree Top Women's College. "I don't know the first thing about rap." Donkey Kong's new collection of recorded raps, entitled "Donkey Kong Jr.," is due out this holiday.